← We are making a REAL difference! A year ago this weekend, four of my dearest girlfriends traveled from all over the country to meet Andy. They spent the weekend fawning over him, preparing freezer meals, and helping around the house. They patiently helped me feed Andy, sometimes one drop at a time, when he started to refuse his bottle. They stood by my side when the pulmonologist recommended that we execute a “Do Not Resuscitate” order for my then-three month old son. They held my hand and stroked my hair as I cried from the pain that spinal muscular atrophy already had caused for my family and the knowledge that the worst was yet to come. Then, they took me out of the house I hadn’t left in weeks – except for the hospital or doctor’s appointments – and spent a day pampering me. They flirted with Alan and fought over who was his favorite. They made us laugh. They gave us hope. It was exactly the support we needed at exactly the right time. What we didn’t know was, that the day after the girls left, Andy would be readmitted to the hospital again…the fourth time in as many weeks. And, that within the next several days, he would undergo surgery to have a feeding tube placed into his stomach. 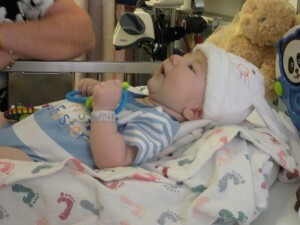 That we would be spending Easter Sunday gathered around his hospital crib, hoping for a smile. That we had just reached the beginning of the end. That just two months later, on June 4, 2009, Andy would be gone. When you have a child, you make certain basic assumptions. When Andy was born, I assumed he had a full life ahead of him. I looked forward to watching him grow and wondered what kind of man he’d one day become. I dreamed of the holidays, birthdays and achievements that we would celebrate with him over the years. I expected skinned knees, some broken rules, a few disappointments, and, perhaps when he got older, a broken heart. I just didn’t realize that the broken heart would come so soon and that it would be mine. I now know that without the help and support of my friends and family, I couldn’t have survived losing my son. Those same girlfriends surrounded me in the days after Andy’s death, taking care of arrangements when I didn’t have the strength and making sure that I got out of bed. They made me smile when they could and again held my hand when they couldn’t. They looked at Andy’s pictures with me and comforted me as I asked why SMA, why him, why us. They made sure I knew that, when they had to leave, they were only a phone call away. And that Andy had forever changed their lives. So, this Easter weekend, which also marks the 10-month anniversary of Andy’s passing, I’m reminded of these bittersweet memories. While my heart remains broken, it also is filled with hope and love. For my beautiful baby boy, who watches over us from his place in heaven. For my friends who continue to stand by my side. For my husband and family who were there with me in the darkest of times and still give me the strength to keep moving forward. For my baby-to-be who will bring joy into our lives once more. For a cure for SMA. Next year, I will take a few moments on Easter Sunday to look at the pictures of Andy, wearing his bunny hat and slippers in his hospital bed. I expect that I will smile through the tears as I remember that day. Then, I’ll wipe my eyes and rejoin my husband as we celebrate our daughter’s first Easter. I’m sure that I’ll take too many pictures and share them all with my girlfriends, whether they like it or not. And, I know that Andy will be right there with us, smiling. Such a wonderful testament to that little life. I am very impressed by both the content of this website and the way it looks. It is really great! And I am so glad that your friends helped your heart so much. I am a better person because of my dear close friends. I am working on letting people help me more! You are doing amazing things for this community, Audra and Alan. Thank you! My sweetest and hopeful friends one day, My name is Sharon and I just wanted to give another shout out of lots of LOVE for you both and let you also know I CARE!!!!! I love what Kris our wonderful friend we have together has done for you and Baby Boy Andy!!! ^j^ I FEEL the pain in what you were saying Audra for this pass Easter sweetie, please KEEP looking at your sweetest babys pictures everyday and Easter. (((hugs))) I know you really don’t know me but that is truly okay, my heart is TRUE and I do pray for you both and your whole families & friends as well. I love how you are taking this HARD stand with what you were faced with…..for others, you and Alan are Blessing from GOD!!!! OH, how I wish I could write what my heart is overflowing with right now. PS We are the couple that lives across the street from the old office where you use to work, Audra. Nothing in this world pulls my heartstrings like these entires, Audra. Your sentiments are so raw and beautiful..filled with the obvious and pure love you have for this precious, precious boy. Thanks for sharing.